CHRIS Herd will be keen to make up for lost time when he goes into camp with the Socceroos next month. 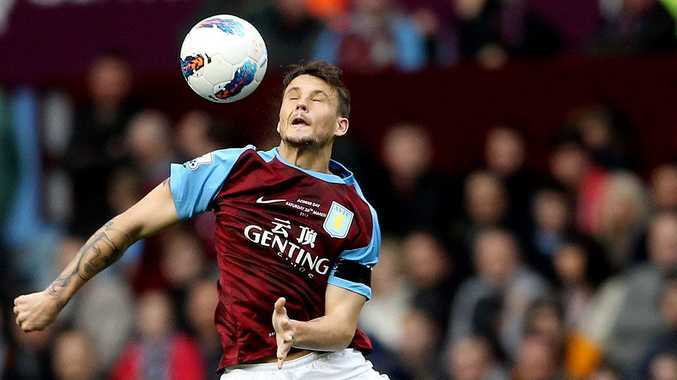 The 23-year-old Aston Villa defender was yesterday named in a 26-man squad to take on Denmark in a friendly in Copenhagen (June 2) before the FIFA World Cup Asian qualifiers against Oman (Muscat, June 8) and Japan (Brisbane, June 12). Herd, who made his English Premier League debut against Manchester United at Villa Park in 2010, was named in the Socceroos squad for the first time last November for the World Cup qualifiers against Oman and Thailand, but had to withdraw because of injury. His selection caps off what has been an eventful month for the Perth-born Herd. He hit the tabloid head-lines after mobile phone footage emerged of him involved in a nightclub brawl. Aston Villa saved its premiership status on the last day of the season and then his club manager Alex McLeish was sacked. Osieck said Herd deserved his opportunity after an impressive season in England. "He's someone we've had in our sights for sometime and was unlucky to miss out last year," he said. Former Brisbane Roar captain Matt McKay, now playing for Korean club Busan I'Park, and former Roar teammates Michael Zullo, Robbie Kruse, Sasa Ognenovski and Alex Brosque will be hoping to do enough to stay in the squad for the clash with Japan at Suncorp Stadium as coach Osieck will cut the squad to 23 ahead of the clash against Oman. Melbourne Victory pair Harry Kewell and Archie Thompson are the only two current A-League players in the squad. Australia must finish top two of its group to qualify automatically for the 2014 World Cup finals in Brazil. In other football news, Tony Popovic has quit his role as assistant manager at English Championship club Crystal Palace and looks set to join the A-League's new western Sydney side as its foundation manager. SOCCEROOS SQUAD: Mark Bresciano, Alex Brosque, Tim Cahill, David Carney, Nathan Coe (GK), Adam Federici (GK), Chris Herd, Brett Holman, Mile Jedinak, Joshua Kennedy, Harry Kewell, Neil Kilkenny, Robbie Kruse, Matt McKay, Mark Milligan, Lucas Neill, Jade North, Sasa Ognenovski, Nikita Rukavytsa, Mark Schwarzer (GK), Matt Spiranovic, Archie Thompson, Carl Valeri, Luke Wilkshire, Rhys Willimas, Michael Zullo.